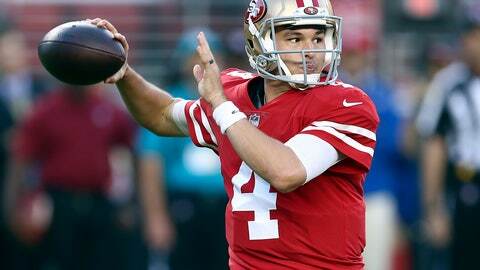 SANTA CLARA, Calif. (AP) — The San Francisco 49ers are sticking with Nick Mullens as their starting quarterback after his spectacular debut performance. Mullens said coach Kyle Shanahan told him Tuesday that he will remain the starter for the upcoming game against the New York Giants. Mullens worked with the starters during a limited practice as the 49ers (2-7) prepare for the Monday night game against New York. C.J. Beathard remains in the backup role after losing the starting job because of an injured wrist. Mullens was sharp in his debut, after spending his first year-plus in the NFL on the practice squad as an undrafted free agent out of Southern Mississippi. Mullens completed 16 of 22 passes for 262 yards, three touchdowns and no interceptions for a 151.9 passer rating in a 34-3 victory over the Oakland Raiders. That’s the highest since the merger for a player in his debut with at least 20 attempts. That performance earned Mullens plenty of praise, especially on social media. But he spent the weekend enjoying time with his family rather than basking in the praise. Mullens provided a big lift to a 49ers team that had lost six straight games heading into the game against the Raiders and had little to play for after a season-ending knee injury to starting quarterback Jimmy Garoppolo in Week 3. Beathard had committed 10 turnovers in his five starts, falling to 1-9 in his career as a starting quarterback. But that all changed in one game with Mullens under center, even though it came against one of the NFL’s worst defenses. In other injury news, cornerback Richard Sherman practiced despite being limited the past few weeks by injuries to his heel and calf. Linebacker Reuben Foster (hamstring) and receiver Pierre Garcon (shoulder, knee) were rehabilitating on the side, while safety Jaquiski Tartt (shoulder) did not practice. The 49ers will take a day off on Wednesday before coming back for the regular week of preparation on Thursday for the game against the Giants.